The declining numbers reflect a decrease in the rate of independent living during the recovery. In 2010, 69% of 18- to 34-year-olds lived independently. As of the first four months of this year, only 67% of Millennials were living independently. Over the same time period, the share of young adults living in their parents’ homes has increased from 24% to 26%. In spite of these positive economic trends and the growth in the 18- to 34-year-old population, there has been no uptick in the number of young adults establishing their own households. In fact, the number of young adults heading their own households is no higher in 2015 (25 million) than it was before the recession began in 2007 (25.2 million). This may have important consequences for the nation’s housing market recovery, as the growing young adult population has not fueled demand for housing units and the furnishings, telecom and cable installations and other ancillary purchases that accompany newly formed households. 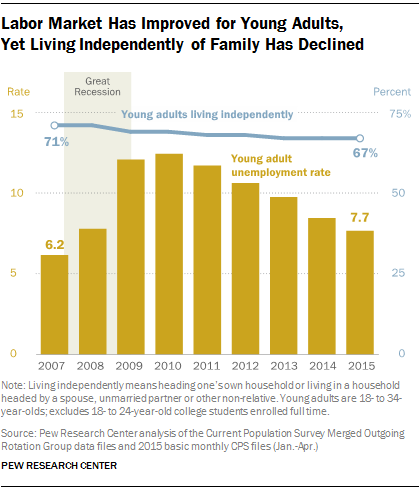 The decline in independent living since the recovery began is apparent among both better-educated young adults and their less-educated counterparts. For example, today 86% of college-educated 25- to 34-year-olds live independently of their families. In 2010, 88% of this demographic lived independently. A similar 2 percentage point slide in independent living is apparent among 25- to 34-year-olds with no education beyond high school. This suggests that trends in young adult living arrangements are not being driven by labor market fortunes, as college-educated young adults have experienced a stronger labor market recovery than less-educated young adults. Trends in living arrangements also show no significant gender differences during the recovery. However, in 2015, 63% of Millennial men lived independently of family, compared with 72% of Millennial women. But a similar gender difference existed during the Great Recession, and both young men and young women are less likely to live independently today than they were five years ago. The latest available census data indicate that there has been no significant increase in the number of young adults living independently of their families since the economic recovery officially began. Over this same period the young adult population has swelled in size; today there are nearly 3 million more adults ages 18 to 34 than there were in 2007. 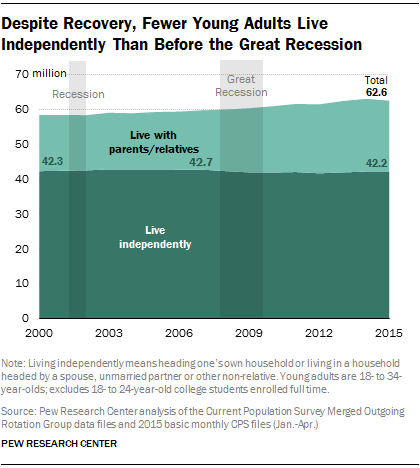 Over the course of the recession and recovery the share of young adults living independently has also declined. In the first third of 2015, 67% of Millennials were living independently, compared with 69% of 18- to 34-year-olds living apart from family in 2010 and 71% in 2007. Most of the decline in independent living since 2007 can be attributed to more young adults living in their parents’ homes. In the first third of 2015, 26% of Millennials lived with their parents. At the beginning of the recovery in 2010, 24% of young adults were living with parents, and in 2007 only 22% were. Findings in this report are based on the monthly Current Population Survey (CPS). Conducted jointly by the U.S. Census Bureau and the Bureau of Labor Statistics, the CPS is the source for the monthly national unemployment rate. The particular CPS data product analyzed is the Merged Outgoing Rotation Group files (MORG files). Each year’s MORG file includes respondents interviewed each month and provides an annual average. One advantage of the MORG is that it has a substantially larger sample size than a basic monthly CPS. The file has about three times the sample size of a basic monthly file, or about 320,000 respondents ages 16 and older. Furthermore, all respondents in the MORG have detailed information on their hourly or weekly earnings and usual weekly hours. A basic monthly file only has this information for a quarter of the respondents. The MORG files were obtained from the National Bureau of Economic Research website. Helpful documentation is available at http://www.nber.org/morg/docs/cpsx.pdf. As discussed further in the Appendix, the information for calendar year 2015 is based on a file using the January, February, March and April 2015 basic monthly CPS files, which is referred to as the first third of 2015. Due to seasonality issues, the first third of 2015 may not be strictly comparable to the complete MORG files. 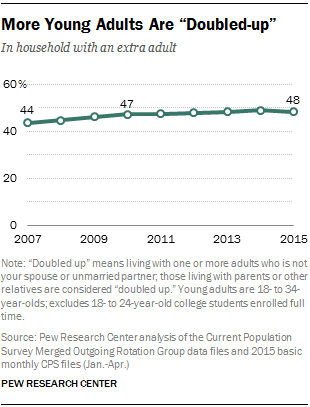 The share of young adults who are living in “doubled-up” households has also increased in recent years. A doubled-up household is one in which there is an extra adult who is not the spouse or unmarried partner of the household head. Young adults living in doubled-up arrangements are of two types. Young adults not living independently are doubled-up because the young adult constitutes the extra adult. In addition, young adults living independently may also be doubled-up if they live with a roommate(s). In the first four months of 2015, 48% of Millennials were doubled-up; in 2010, 47% of 18- to 34-year-olds were living in this type of household. The 48% of Millennials who were doubled-up in 2015 includes 33% who were living in a household headed by a parent or other adult relative and 16% who were living in households headed by a non-relative or heading their own households with an extra adult (which may or may not include a family member). Accompanying the growth in doubling-up has been a lack of growth in the number of households established by young adults. In the first third of 2015, 25 million Millennials headed their own households, no greater than the 25.2 million households headed by young adults in 2007. This has happened at the same time that the absolute number of 18- to 34-year-olds has increased from 59.8 to 62.6 million. 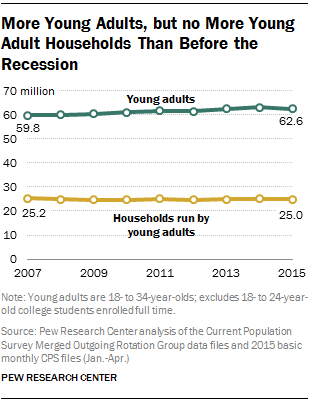 In terms of the share of young adults running their own households, 40% do so in 2015, down from 42% in 2007. The decline in the rate at which young adults are forming households from 2007 to 2015 has had a negative impact on the demand for the nation’s housing and, in turn, residential construction. Because of the recession, there are substantially fewer households than would have been predicted based on population growth; using CPS data through 2011 an economist estimated that the shortfall in the number of young adult households accounted for almost three-quarters of the total 2.6 million shortfall in households throughout the economy.5 In other words, young adults have been a key demographic in the nation’s housing bust. Four years later, the rate at which they are forming households is no higher than it was in 2011. The decline in independent living during the recovery has occurred in the context of a substantial, albeit incomplete, recovery of the labor market for young adults.6 On an annual basis, unemployment among 18- to 34-year-olds peaked at 12.4% in 2010. As of the first third of 2015, unemployment among young adults in this age group was 7.7%, nearly 40% below the peak. However, it was still above the 6.2% unemployment rate in 2007, before the Great Recession. The share of young adults who are employed has increased from 69% in 2010 to 72% today. In addition, the share of young adult workers employed full-time has increased. In 2009, only 70% of 18- to 34-year-old employees worked full-time, the lowest share during the recession. By the first third of 2015, that share had risen to 74%. 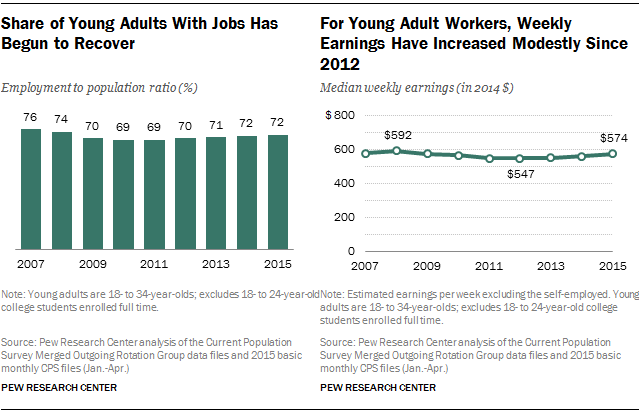 Some evidence suggests that the earnings of young adults have begun to rebound. The median weekly earnings of young adult workers peaked at $592 in 2008 (all dollar figures are adjusted for inflation).8 After bottoming out at $547 in 2012, median weekly earnings are estimated at $574 in the first third of 2015. One of the silver linings of the Great Recession was that it drove an increasing share of young adults toward higher education. Some enrolled in college to ride out the economic storm, while others went back to school to gain additional skills and make themselves more marketable. By 2012, 37% of 18- to 24-year-olds were enrolled in college, a substantial increase over the 34% enrolled in 2007. 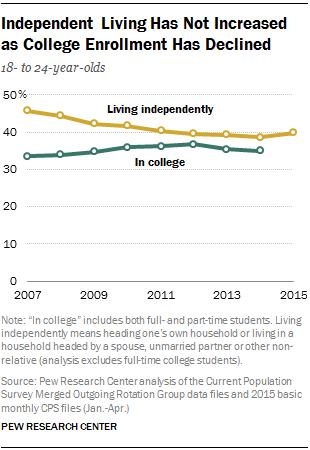 And as college enrollment rose, fewer 18- to 24-year-olds lived independently. By 2012, only 39% of 18- to 24-year-olds (not including full-time students) lived independently, down substantially from the 46% share living independently in 2007. College-going peaked in 2012. By 2014, 35% of 18- to 24-year-olds were pursuing college, down 2 percentage points from the peak. But contrary to expectations, the college enrollment decline has not stimulated an increase in independent living. Today, most younger Millennials do not live independently of family. By the first third of 2015 only 40% of 18- to 24-year-olds were living apart from their families. For young adults, a college education provided a partial life raft during the recession and has proven beneficial during the recovery as well. College-educated young adults have been quicker to regain the ground they lost in terms of job-holding and wages. But this hasn’t led them to venture out on their own and establish their own households. The downward trend in independent living among young adults has occurred across groups with different levels of educational attainment. 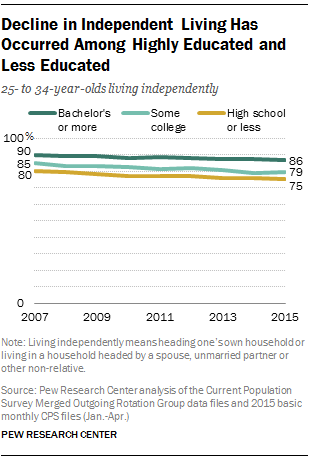 That said, college-educated young adults remain more likely than those without a college degree to live independently of their parents. As of the first third of 2015, 86% of college-educated 25- to 34-year-olds lived independently of family, compared with 75% of 25- to 34-year-olds with no more than a high school education.9 Nonetheless, even among the highly educated, the share living on their own has trended downward during the recovery. Nine-in-ten young adults with at least a bachelor’s degree were living independently in 2007, before the recession hit. Recent research using credit report data has indicated that student loan debt and difficulties paying off debt deter independent living among young adults.10 Both the likelihood of borrowing for education and the amounts borrowed tend to increase with the young adult’s education. Young adults with no education beyond high school presumably have minimal student debt burdens. The very similar decline in independent living across education groups suggests that additional factors beyond education debt are impacting the decisions to co-reside with family. College-educated adults continue to be more likely than their less-educated counterparts to establish their own households. Some 51% of 25- to 34-year-olds with at least a bachelor’s degree run a household, compared with only 43% of their peers with no education beyond high school. However, relative to 2007, household formation rates have fallen regardless of education level. In 2007, 54% of bachelor’s degree holders and 46% of those with a high school education or less were heads of households. Turning to the labor market, if recovery is judged on the basis of return to the labor market outcomes of 2007, before the Great Recession began, then better-educated young adults have fared significantly better than their less-educated counterparts. As of the first third of 2015, the unemployment rate of 25- to 34-year-olds remained significantly above 2007 levels for each education group. For college-educated Millennials the unemployment rate was about 2.9%, compared with 2.1% of young adults ages 25-34 before the recession began. By comparison, unemployment for 25- to 34-year-olds with no education beyond high school stood at 9.3% in the first third of 2015, still 2.7 percentage points higher than the unemployment rate for this group in 2007. The better fortunes for college-educated young adults are more apparent in job-holding. As of the first third of 2015, 85% of college-educated 25- to 34-year-olds were employed. In 2007, 87% of this group had jobs. Their less-educated peers experienced greater employment declines during the recession, and their employment rates remain substantially below their 2007 levels. For example, among young adults with no education beyond high school, 67% had jobs in the first third of 2015 compared with 73% in 2007. In 2015, 83% of college-educated 25- to 34-year-old workers were employed full time, higher than the 81% of this group that was employed full time in 2007. In contrast, the likelihood of full-time work has not fully recovered for young workers without a bachelor’s degree. In 2015, 74% of young workers with some college experience but not a bachelor’s degree were employed full time; before the recession, 77% of these workers had a full-time job. Finally, the weekly earnings of college-educated young adults have nearly recovered. In 2015, the earnings of these workers ($951/week) were almost back to the 2007 level ($966/week). Less-educated workers have seen a more modest recovery in their earnings. For example, for young adults with no education beyond high school, earnings were $500 per week in the first third of 2015, still 5% below their 2007 level ($527/week). In the labor market, the outcomes of college-educated young adults have made the greatest rebound from the ravages of the Great Recession. But, living arrangements seem to have come unhinged from cyclical labor market conditions as all young adults have become less likely to live independently as the recovery has progressed.